A 17-year-old likely will face misdemeanor charges after allegedly losing control of his car while text messaging and hitting a bicyclist. The bicyclist, Jim R. Price of Highlands Ranch, died Friday, two days after the accident. The spokesman for Douglas County Sheriff’s Office stated that the driver could face a charge of careless driving resulting in death. Under Colorado law, the teen could face up to a year in prison. 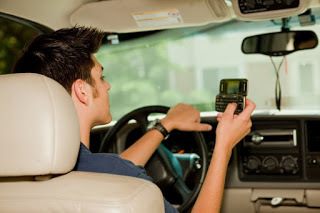 Cellular phones: About 30% of all drivers use a cell phone while driving to make outgoing or incoming calls on at least some of their driving trips. An estimated 292,000 drivers were involved in a crash attributed to cell phone use between 1997 and 2002. Drowsiness: 37% of the driving population says they have nodded off for at least a moment or fallen asleep while driving at some time in their life. An estimated 7.5 million drivers have fallen asleep while driving during a given month. Dealing with children: Nearly one in four (24%) drivers deal with children in the back seat of the car while driving. Eating or drinking: Half of all drivers (49%) report eating or drinking at least occasionally while driving, with 14% doing so on three-quarters or more of their driving trips. When you drive, don’t allow poor judgment or distractions to interfere with your driving. Put safety first!